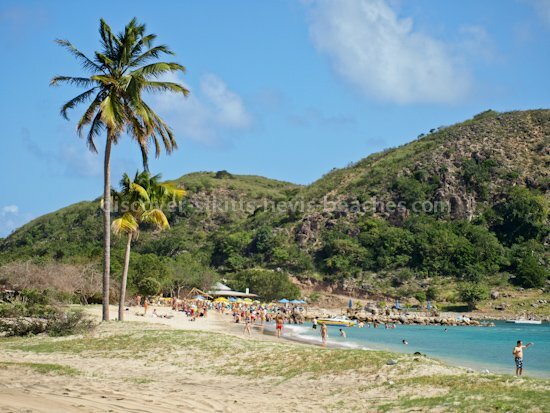 Why should you choose St Kitts beaches when there are so many other beautiful Caribbean beaches to choose from? 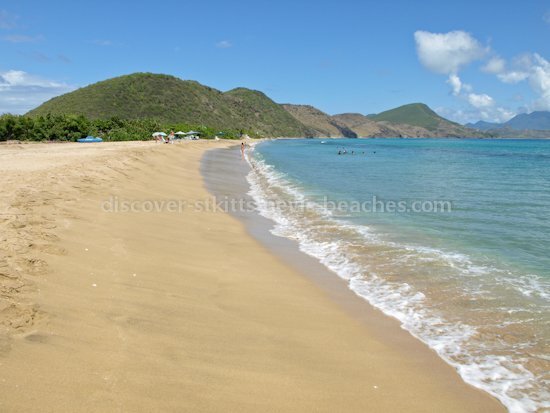 So you want to know what's the deal about St Kitts beaches? One word sums it all up... diversity. First, the beaches of St Kitts offer a choice between soft golden sand beaches primarily found on the Southeast Peninsula and intriguing black/grey sand beaches scattered along the northern and south-western coastlines. Further, the beaches can also be classified by location into Atlantic coast (windward) beaches and Caribbean coast (leeward) beaches. 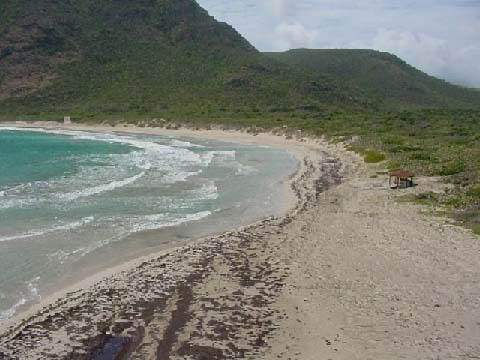 The diversity of St Kitts beaches is also reflected in the different landscapes that surround these beaches. I can go on talking about the diverse nature of the beaches of St Kitts, but as the saying goes, a picture is worth a thousand words. 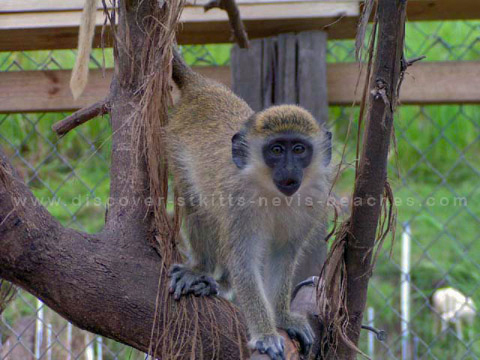 So in the photos below, I have attempted to give you a glimpse of what I mean by the diversity of St Kitts beaches. 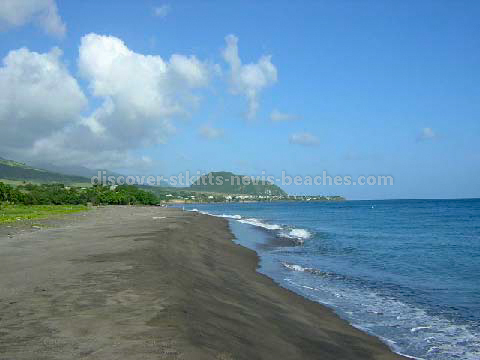 St Kitts beaches account for some 26.3 km of the island's 78.1 km long coastline. The beaches are generally of two types: coral golden sand beaches spread across 13.2 km of the coastline and 13.1 km of volcanic black/grey sand beaches. The remainder of the coastline is made up of cliffs, cobble and boulders and rocks. 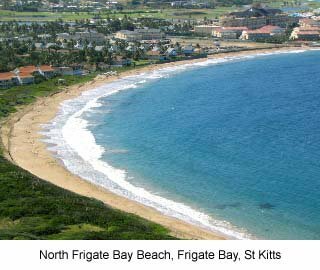 How many St Kitts beaches are there? I counted about nineteen beaches on a map displayed at the office of the St Christopher Heritage Society now the St. Christopher National Trust. This map, which shows heritage and natural attractions in St Kitts and Nevis, was prepared by the Department of Regional Development and Environment of the Organization of American States (OAS), with the collaboration of the St Christopher Heritage Society, the Nevis Historical and Conservation Society (NHCS), The St Kitts Sugar Manufacturing Corporation, the St Kitts Department of Community Affairs and the Island Resources Foundation as part of a Tourism Master Plan project funded by the OAS. As can be seen from the list above, most of the beaches are located on the Southeast Peninsula. The Southeast Peninsula also has some smaller, unnamed beaches interspersed along its shoreline. There are also some smaller less known beaches that are scattered along the rest of the coastline but which are not detailed on the map. 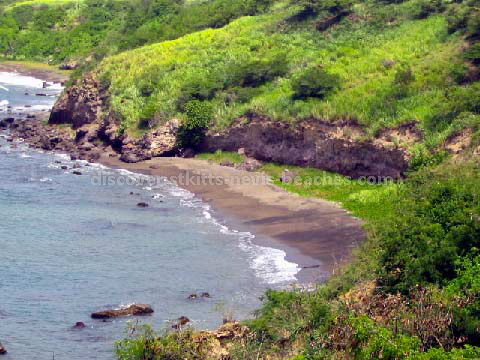 These are mostly black sand beaches used by the locals for swimming, walking and fishing. The popular beaches offer a variety of beach and water sport activities including beach volleyball, swimming, snorkelling, diving, water skiing, body-surfing and windsurfing among others. For those beaches that are not ideal for swimming or other water sports, the tranquil surroundings render them perfect for horseback riding, sea turtle nesting, a leisurely stroll or for sunbathing while relaxing on the sand. Do remember to bring along your sunscreen and sunglasses for your protection. During the tourism high season from December 15 - April 15, you will notice an increase in the number of tourists on the beaches during the daytime hours. Many of these are cruise ship visitors whose shore excursion included some cool down time at the beach such as the St Kitts tours and island safaris offered by Captain Sunshine tours or the St Kitts eco-safari tours offered by Poinciana Tours. On the other hand you may find those cruise visitors who just opted to spend the day basking in the sun while enjoying a holistic body massage or enjoying the water sports and other shore activities. In addition to being home to beach resorts, beach hotels, villas and condominiums, St Kitts beaches provide perfect spots for family beach picnics. If you'd like to enjoy this beach picnic experience, do pack a picnic basket with lots of goodies from the local supermarkets and head for a beach of your choice for a relaxing day out. However, if you can't be bothered with taking along your own food and drinks, then your trip to the beach is a great opportunity for you to sample the local cuisine from one of the local beach bars such as Reggae Beach Bar, Monkey Bar, Mr X Shiggidy Shack Bar & Grill, the Ship Wreck Bar and Grill, and Lion Rock Beach Bar located on the popular beaches. In addition to the above activities, St Kitts beaches also provide that picture perfect romantic setting for beach weddings. So if you are thinking about tying the knot on one of the many beautiful Caribbean beaches, why not consider one of our secluded beaches as the choice for your wedding. The scenic vistas and beauty of the surrounding landscape will no doubt fulfil your dream of beginning your married life in paradise. 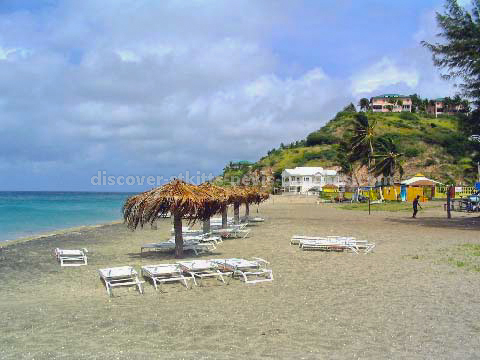 So whether you are looking for a romantic setting for your beach wedding, a tranquil relaxing getaway, exciting beach and water sport activities or that perfect spot for your family beach vacation, St Kitts beaches have something to offer you. For more information on how you can get here to join in the fun on St Kitts beaches, please visit my air travel to St Kitts Nevis and Caribbean cruises to St Kitts Nevis pages.